A newly unveiled U.S. strategy aims to enlist other countries to help safeguard national space assets against both hostile threats and orbital space debris. The National Security Space Strategy directs the Department of Defense and the Office of the Director of National Intelligence on how to follow the country's National Space Policy, which was announced by the president last June. It is the first such document co-signed by the secretary of defense and the director of national intelligence, said Gregory Schulte, the deputy secretary of defense for space policy. "Space becomes critical to everything we do, and that’s why we're worried that the environment is increasingly challenging," Schulte said. "You have more debris in space and you have countries that are developing counterspace capabilities that can be used against us." The space strategy emphasizes not only the ability to survive and operate in an increasingly dangerous space environment, but also the need to protect that space environment as well as the country's industrial base which supports space launches and operations. "The National Security Space Strategy represents a significant departure from past practice," said Robert Gates, U.S. secretary of defense. "It is a pragmatic approach to maintain the advantages we derive from space while confronting the new challenges we face." Both the National Security Space Strategy and the National Space Policy reflect a policy shift in response to a "fundamental change in the nature of space security," according to Brian Weeden, a technical adviser for the Secure World Foundation, an organization dedicated to the sustainable use of space. That change comes from recognizing the dual threat of anti-satellite weapons and the growing cloud of debris surrounding Earth. The new U.S. stance also goes beyond the days when the U.S. and the Soviet Union faced off in the space race, or when the U.S. enjoyed sole superpower status with few other countries operating in space. Now there are almost 60 different commercial companies or countries that own or operate assets in space. The crowded future of space means many more possibly competing interests acting in the same region – a scenario ripe for conflict or misunderstandings. 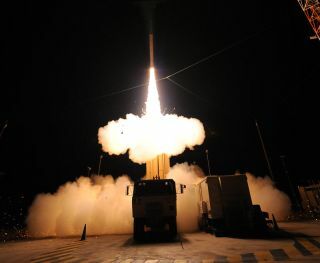 "The problem now, which the U.S. military has said multiple times, is that space is the Wild West," Weeden told SPACE.com. "Outside of a few existing treaties, it's pretty much do whatever you want." Part of the solution to that problem comes from setting some rules. The U.S. space strategy throws its weight behind a European Union proposal for a code of conduct in space, which would define responsible behaviors and best practices for space-faring countries. Getting such agreement is also crucial for the encouraging commercial development and innovation in the growing space industry, Weeden pointed out. Clear rules allow companies to develop their business plans for commercializing space and to get a better sense of the long-term profits and risks. "Establishing some sort of norm of behavior is a necessary part of enabling the long-term sustainability of space for military, scientific and commercial purposes," Weeden said. "But that alone is not sufficient." The U.S. Strategic Command has also struck deals with 19 companies to share space situational awareness data, and has signed similar agreements with certain countries. Having a broader shared awareness allows the U.S. to better monitor the growing crowd of satellites and other space assets — perhaps avoiding repeats of satellite collisions. Indeed, the first such satellite collision resulted in the destruction of a U.S. Iridium 33 satellite and Russia's spent Cosmos 2251 communications craft, which added to the space debris that has already threatened both the space shuttle and International Space Station. The U.S. space strategy also aims to defuse the possibility of hostile action by boosting international cooperation. In that spirit, the Department of Defense plans to preannounce space launches so as to avoid the swirl of uncertainty and paranoia from other countries. Such "transparency and confidence-building measures" have already been applied on international issues such as nuclear security, but could take a bigger role based on the U.S. space strategy, Weeden said. The Joint Space Operations Center at Vandenberg Air Force Base, Calif., is also expected to become a "combined center" that allows for more international participation. An equally important step comes from the Department of Defense's interest in sharing satellites or other space assets with other countries. A hostile country might think twice before destroying a satellite used by three or four other countries and thereby invoking their collective wrath, Weeden explained. The U.S. and Australia have already partnered to expand the Wideband Global Satellite Communications constellation, and the U.S. is seeking similar cooperative opportunities with other countries. Sharing space assets among countries also helps the U.S. during a time of budget deficits and expected budget cuts. The Department of Defense has begun talking about hosting payloads on commercial satellites in the "budget-constrained environment," Schulte said. Such steps make sense from a budget standpoint and because of the U.S. military's difficulty in having new space assets delivered on time and on budget, according to Weeden. "We're already routing a huge amount of communications to [U.S. forces in] Afghanistan through commercial satellite networks," Weeden said.